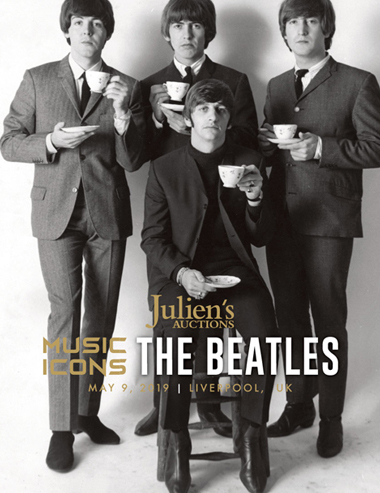 Julien’s Auctions is excited to present MUSIC ICONS: THE BEATLES IN LIVERPOOL, a thrilling “all Beatles” auction taking place on Thursday, May 9th at The Beatles Story Museum in Liverpool, England, the charming and informative venue that attracts millions of Beatles fans and visitors every year. Hundreds of pieces related to, arguably, the best rock and roll band ever will be on offer including many that have never before been seen by the public. The preview will be open to all where a selection of the top lots will be on display at the museum itself, right in the heart of the city where the band got their start over 50 years ago. A few special highlights include John Lennon’s own copy of the album “Yesterday and Today” that he drew on and autographed for a bootlegger in a “trade deal” in order to obtain some Beatles recordings he wanted, school records from Quarry Bank High School for Boys showing how the young rebel Lennon received detentions, a baseball signed by all four Beatles during their historic last concert at Candlestick Park in San Francisco in August 1966, a television script signed by all four from a British TV show they appeared on in 1963, George Harrison’s handwritten lyrics for his moving song, “Bangla Desh,” an actual door from the famous Tittenhurst Park mansion where Lennon and Yoko Ono lived for a couple of years until they sold it to Ringo Starr where he then lived, plus so many other items that relate to the four guys who need no last names: John, Paul, George, and Ringo.